Few things can match the natural beauty of the many stone products available today. A fieldstone seat wall surrounding a bluestone patio, granite steps and landings leading to your front door, or a custom stone barbecue are just a few ways we can use natural stone to enhance your landscape. Applications can range from soft, natural settings, to formal, tailored looks suited to the contemporary landscape. Whether you need to retain a small slope or create a twenty-foot grade change, we can create custom retaining walls from natural stone, or from the many modular wall systems available today. Modular retaining walls are an effective and aesthetically pleasing way to solve troublesome grade changes and dangerous slopes in a cost effective manner. The many products available provide almost limitless design possibilities suitable for almost any application. 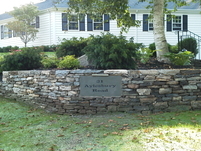 Contact us today for a free custom stonework consultation with one of our representatives.